The NASA/ESA Hubble Space Telescope is back in business. Just a couple of days after the orbiting observatory was brought back online, Hubble aimed its prime working camera, the Wide Field Planetary Camera 2 (WFPC2), at a particularly intriguing target, a pair of gravitationally interacting galaxies called Arp 147. 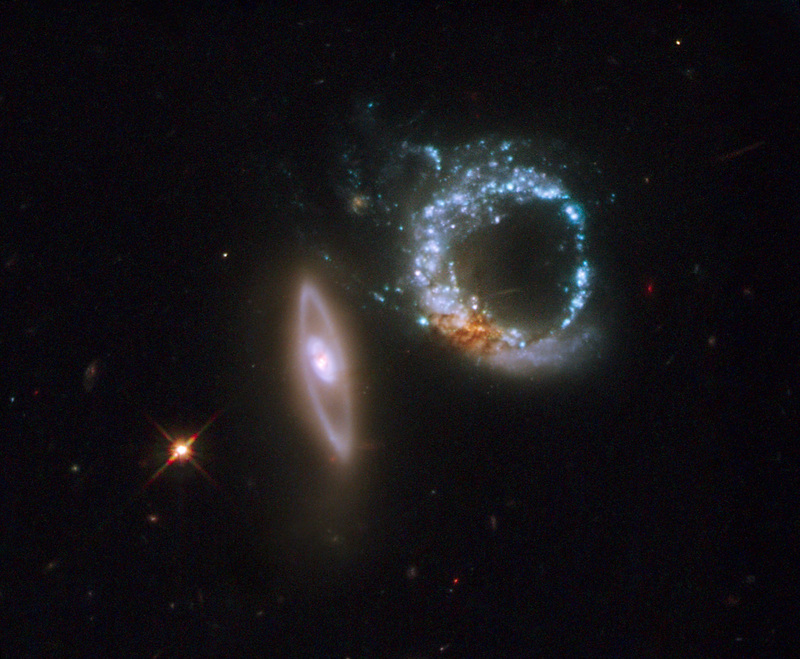 The two galaxies happen to be oriented so that they appear to mark the number 10. The left-most galaxy, or the "one" in this image, is relatively undisturbed, apart from a smooth ring of starlight. It appears nearly edge-on to our line of sight. The right-most galaxy, the "zero" of the pair, exhibits a clumpy, blue ring of intense star formation. Position (Dec): 1° 18' 50.73"